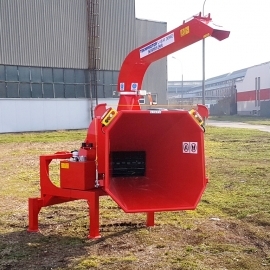 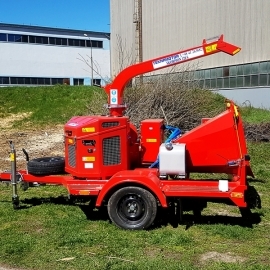 Skorpion 350 SDB is the drum-type chipper build in the form of special purpose trailer, meant to work with the wood wastes of the diameter up to 250 mm. 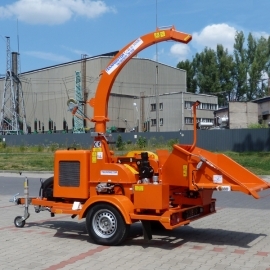 The chipper is powered by 4 cylinder, 74,8 HP turbocharged diesel engine Kohler or Hatz furnished with a bonnet. 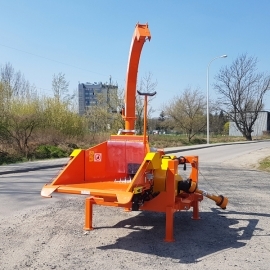 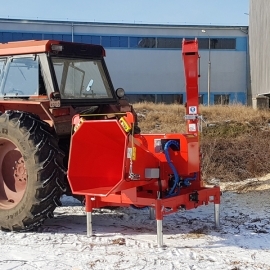 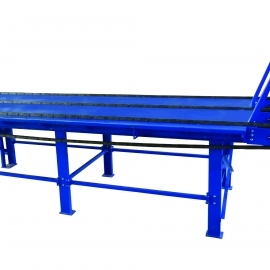 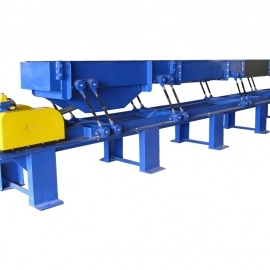 The feeding system consists of toothed upper roll, which pulls in and press the wood (ø 380mm) and toothed metal crawler (75 cm in length), preceded by the foldable feeding table. 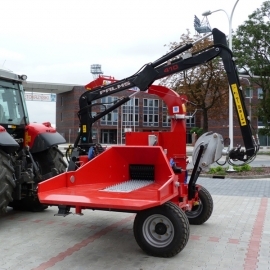 The roll and crawler are both driven by hydraulic motors, powered by own hydraulic pump, installed on the chipper. 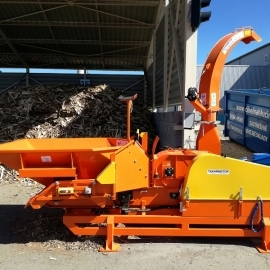 Sectoral cutting system consisting of 2 knives on the drum (one cut on one full turn) and one counter knife provides great potential of the chipper in relation to the load of the drive. 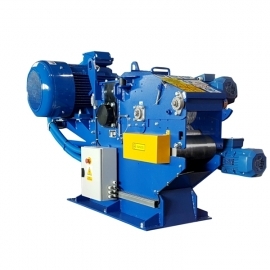 The 30x30 or 50x50 mm screen surrounding the drum ensures the production of regular fraction in the standard G30 and G50. 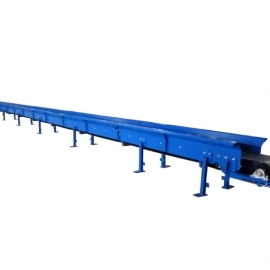 A large loading space (375 x 340 mm opening) allows to work with specious branches and other, bulky waste wood. 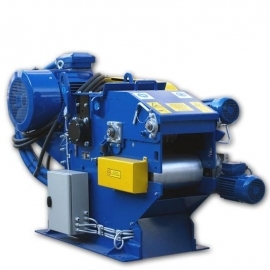 Chips are ejected through a rotary ejection tube that can be turned by 360 degrees in relation to the chassis. 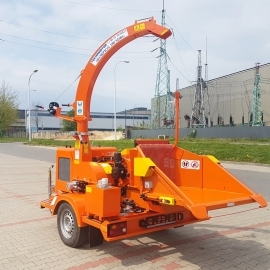 Chipper Skorpion 350 SDB has got the EC Vehicle Type- Approval Certificate which allows registration of the machine and licensing it for the road traffic. 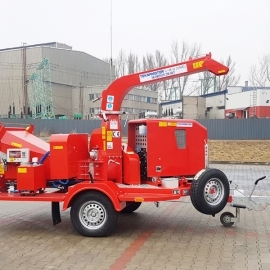 The chipper is set on a single axle, equipped with mechanical overrunning braking system and a hook-type coupling for towing adjusted to its interchangeable part - a grip for using a ball pin or a towing eye. 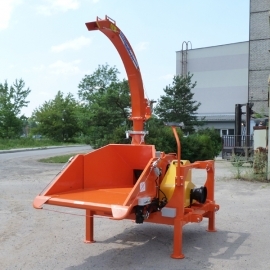 Such construction of the chipper allows the quick movement between jobs. 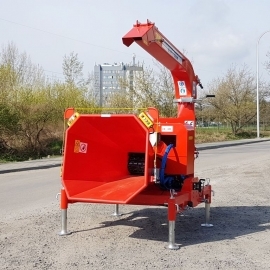 The chipper is also additionally equipped with a state of the art electronic system of work control, available on European market which automatically prevents overloading of the propulsion system, by temporarily stopping the feeding. 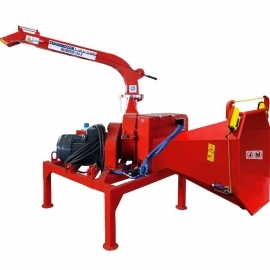 Easily editable software of this No-stress system provides a simple way to change the settings of the machine and to adapt to individual needs. 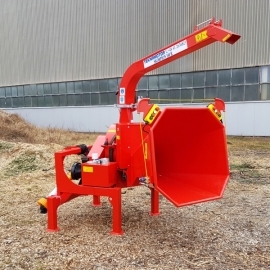 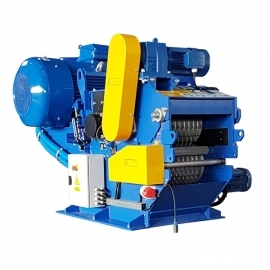 The "thick wood" and "thin wood" preset programs allows the operator to quickly change the mode of operation of the chipper in order to match the current material to be shredded and increase the effectiveness of work. 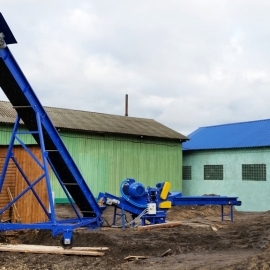 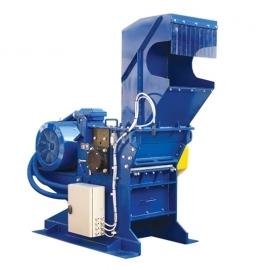 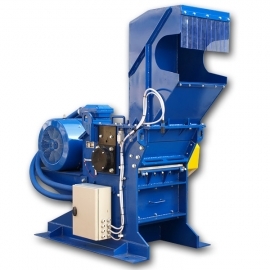 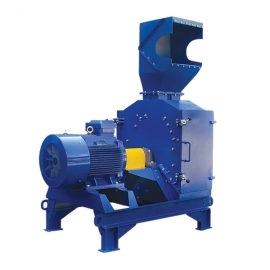 Chips made by this chipper can be used as a solid fuel for heating, as a raw material for plywood production or – after further work on beater mills - to produce briquettes and pellets. 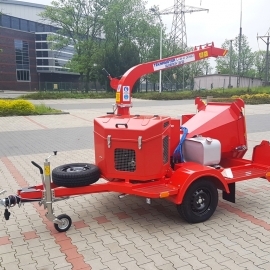 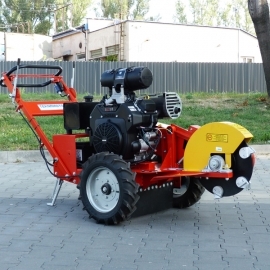 Purchase of Skorpion 350 SDB is the optimal solution for companies and businesses which develop their business in a modern and environmentally friendly direction.